Lakshmi Kuber Homam is performed with an intension of gaining legitimate wealth. Those who are involved in Business or are facing Financial problems like monetary shortage or losses should perform this Homam to receive the blessings and grace of Goddess Lakshmi. Lakshmi Kuber Homam is performed with an intension of gaining legitimate wealth. Those who are involved in Business or are facing Financial problems like monetary shortage or losses should perform this Homam to receive the blessings and grace of Goddess Lakshmi. The Yantra (a symbol embossed in square metal sheet) which is used in the Homa, will invoke riches dispelling any curse or obstacle in obtaining the same. It is one of the most influential homa for acquiring wealth and prosperity. It is performed for faster recovery in losses and to speed up early payment for clearing the dues. It is performed to please the Adhipathi (Emperor) of wealth and prosperity. Swasti Vachan, Shanti Path, Sankalp, Ganesh Sthapan, Kalash Sthapan, Lakshmi Kuber Sthapan, Navgrah Sthapan, Brahma Sthapan, Agni Sthapan, Invocation of all Gods & Goddesses, Navgrah Mantra Japa ( 1 mala for each planet ), Lakshmi Suktam for 11 times, Lakshmi Mantra Japa for 2100 times, Kuber Mantra Japa for 2100 times, Lakshmi Yantra Pujan, Kuber Yantra Pujan, Homam with Ghee, Sugar, Til, Oats ( Jow ), Ashtagandh, Sandalwood powder, Navgrah Samidha and then Purnahuti, Aarti and Prasad to Brahmins. 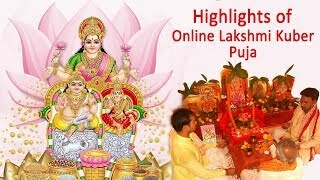 The exact Date and Timings of Lakshmi Kuber Puja will be informed to you through an email and your representatives are most welcome to attend the same.